Contributed by: Mary McGlynn, CEO, PowerSpeaking, Inc. It truly was a dark and stormy night in March of 1954 when a fierce lightning storm created a violent explosion to our barn in rural Wisconsin. The barn burst into flames with the dry hay fueling the raging inferno. By the time my Mother woke up, the sky was a blazing orange. The volunteer firefighters from our village were called but there was no way to save the barn. Over the course of the night, almost all of our cattle died in their stanchions; the newly purchased farming equipment was destroyed; and my parents lost their source of livelihood. I was five years old, was one of six siblings, and for the first time witnessed my parents crying. But that’s not the end of the story—but the beginning of a glorious life lesson. The neighbors showed up the next morning to bulldoze a great big hole to bury our cows. The meals showed up to help feed our family. In the latter part of the spring the village men set up a sawmill to cut and plane the lumber from our woods for our next barn that lasts to this day. 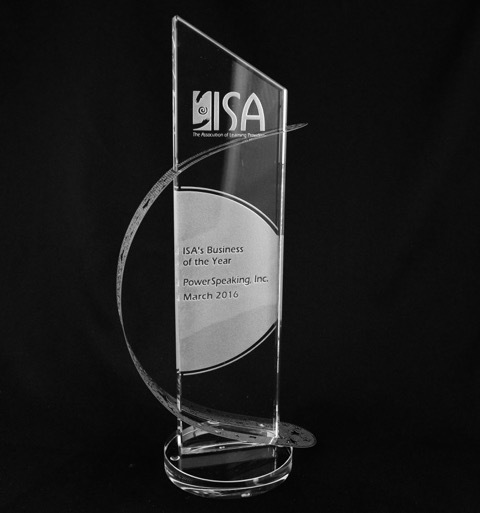 That was the beginning of my acceptance of the Instructional Systems Association (ISA) Business of the Year Award in March, 2016. The keynote was in front of 160 colleagues and dear friends: it meant a lot. There is always reflection after a talk: what would I have done differently; what worked. Today I offer six reflections. My hope is that you will be able to apply the life lessons to your talks in the future.